She was holding a conversation with me this afternoon. She's quite the talker sometimes. It was a fairly busy day today wrapping up a few things before I left for the long holiday weekend. I fully intend to get several things done around home tomorrow (Friday) so that they are out of the way and won't have to be dealt with later on in the weekend. Additionally, we made a trek to Alexandria tonight for the obligatory Wal-Mart run. It's not my favorite place to go, but it's a necessary evil. We did manage to get a pretty good deal on diapers at Target, though. Way better than Wal-Mart. And cat litter is cheaper at Target too. Go figure. Anyway, that means I really didn't get much of anything done at home today, but I've been keeping busy. For as many random things as I've accomplished lately, there's nothing of great importance about which to write. But seeing as how I'm taking the day off tomorrow, I am going to cut this a bit on the short order, head for bed a bit early, and sleep in late tomorrow. She's been big into rolling onto her tummy and flailing around on the floor while playing. It must add a new dimension to the whole playing thing. The post tonight is going to be pretty straightforward. I'm not feeling particularly verbose, but that's mostly because I spent about an hour and a half tonight finishing the 'import' of the old news system posts to the blog archive here. So I've done enough posting tonight to get the 'word verification' box again. That likely won't ever happen again, because I have no intention of entering another hundred posts in a day for as long as possible (read: ever). Tonight when I fed the dogs, I put the lawnmower gas cans in my pickup so I don't forget them again like I have the last two days. That will be Friday's project (to mow the lawn). The entire lawn needs to be mowed this time, and I'm not particularly looking forward to it (because it's nearing the 'needs to be baled' stage). But it should go fairly well overall. It just takes time. I was a little disappointed in today's Morris paper. We didn't get the B section. We got everything else (the inserts and whatnot), but no B section. Honestly, I skim pretty much everything in that section of the paper, but not having it completely kinda throws me off a bit. So it messed with me enough where I'll have to see about reading/skimming it tomorrow during morning coffee. Man, I just ran into a block wall here with my thought process. I had something somewhat profound to write, but I completely lost it. Ah well, I'll write it off to being a bit on the tired order. I'll remember it about 3AM, then forget about it until next Tuesday or something. It's tough being a baby that's recovering from her first cold. And teething. She's been sleeping a lot lately, but then again she's growing (as normal) and has been really wide awake and active when she's not sleeping...so presumably that's a Good Thing. I don't necessarily have a lot about which to write, so I'll ramble a bit about Kirstin. She's been recovering from her first cold now for the last few days, and therefore has been quite the sleepy girl. She's been taking it pretty well, though. She's always happy and ready to go when she's awake, and she doesn't fight off the sleep business or anything (at least not more than normal). She does seem (at least in my observation) to get sleepy very quickly, and shortly thereafter is out. It doesn't take much (or any) coaxing, and she has been in good spirits, so that's nice. She's not constantly screaming in pain or the like. In random news, today I encountered an article (I didn't save it, because it wasn't really all that interesting) about a group of people that go 'diaperless' from birth. These people essentially potty train their children once out of the womb. It seems a little on the ridiculous order, especially considering that a one-month old can't figure out his/her fingers (let alone 'give advance warning' of an impending evacuation). So in a way, it's potty training the parents...at least for the first year or so. Introducing the only flushable toddler urinal! Now boys can learn standing up from the start. The low basin makes aiming easier, promoting success and reducing mess. And kids love pushing the flush button when they're done! Includes fillable water tank (no plumbing needed) and removable holding tray with all-day capacity. Great for transitioning to standing, too. Height adjustable. Okay, there's something dramatically wrong with this. For starters (I know you can't see this), the picture accompanying it has a kid (he's probably four years old) leaning against said urinal with a big smile on his face. Eesh. I can just imagine -- "Hey, Johnny -- go stand by the urinal and smile for the camera..." Only in America. Specifically Appalachia. My two favorite parts of the description, though: And kids love pushing the flush button when they're done! Look, kids! It flushes! Water. Boys. Free-standing device. Container of urine. Looks like a recipe for at least three-strikes against this device. Buyer beware. My other favorite: ...removable holding tray with all-day capacity. Does it come with a cake as well? I'd hope so. I've been around plenty of urinals in my time, and unless there's some sort of deodorizing device (or plumbing to remove urine from vicinity), there's no way I would leave this alone for a day. See my previous bit about at least three strikes. Add two more. Piss stinks -- bad. Boys. Guess I repeated one there, but I was once a boy myself. I don't recall playing in urine, but that doesn't mean it didn't happen, either. The only thing this device has going for it is the idea of introducing a urinal to a child. That unfamiliar device can be quite daunting to a young'un (especially at first), but I'm not sure that benefit outweighs the other 'risk factors' I mentioned. Ah well. People apparently have too much money to spend on stuff like that anyway... There's no way I'd shell out $40 for a device we've already got (albeit in different form) installed and plumbed. George is trying to stay comfortable and ignore the periodic kicking and petting he's getting from Kirstin. Since Tuesday is the only real work day of the week, we can leave the statement at that. It was a traditional Monday, with not much new transpiring. I have felt lazy today since I got home from work, and that wlll follow through here. I spent a lot of time on the couch this evening (see picture). I find myself not having anything unusual or exciting to post about tonight; hopefully tomorrow will be better in that regard. Here you can see the second place team work like it's going out of style. If memory serves, there was 8,500 pounds of salt during this pull, which they didn't complete. After church and the normal morning activities, we had Erik & Jill (and Henry) out for dinner prior to the day's activities in Donnelly (since they were going to be in the neighborhood anyway for the parade). Their 1977 Mercedes convertible (aforementioned is a sweet ride, by the way) was going to be used in the parade. I managed to catch some threshing going on today, so that was cool. It's always neat to see the old stuff running again. I've seen threshing done several times in my life and it really doesn't get old. It's also really interesting to see how it draws a crowd of people once they hear the equipment spinning and whatnot. I took some pictures today (since we had the camera along), and I ended up creating an entire set of 2007 Threshing Bee pictures as a result. There aren't that many, but it's a fairly good sampling regardless. 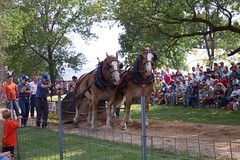 We also sat in on the horse pull again this year. I'm not a big fan of horses (quite the contrary, to be honest), but it's really amazing to see these finely-tuned teams in operation (as in the blog picture today). These teams are anywhere between 3,750 and 4,500 pounds combined, and they pull upwards of 9,000 pounds of very dead weight (softener salt). I didn't take any pictures of the horse pulling until the very end, when all the teams really start struggling (and the power becomes obvious). Anyway, short of that it's been a pretty quiet evening. I think we got home somewhere around 5pm, and it's been pretty relaxing (a good change). Even though I didn't manage to get a lot of stuff done that I'd hoped, we actually did quite a bit of stuff this weekend. It's cool to be able to see the old tractors and everything else that makes the annual celebration unique.